In this era of Green IT and the EU’s General Data Protection Regulation (GDPR), many organizations are going paperless. To help, there’s a plethora of document management systems (DMS) that can not only reduce waste, but also streamline business processes. Spending time and money on printing and storing paper documents is increasingly seen as bad idea. Not only is there a risk of physical copies getting lost and damaged, but you’re also responsible for keeping them on file. And they’ll soon stack up around your office. By implementing moving things to a document management system (DMS) in your operations, you’ll free up time to spend on other vital areas of your company. You’re also much safer knowing that all your precious documents and files are stored and organized via software, as opposed to being scattered around a storage room. These systems have been around for a few years, but they’re constantly getting more affordable and advanced. Here’s a selection of six of the best offerings currently available taking into account price, features, professional reviews, and user experiences. Templafy is one of the best document management tools out there. The system aims to integrate essential office suites and solutions used by businesses on a daily basis. If there’s one thing that can be frustrating, it’s having to create brand documents using different software. This can become time-consuming and fragmented, but Templafy can help. With it, you can create a range of files within the system and manage them from a single feed. The software is compatible with a range of devices and uses the cloud to let you access all your documents across computers, tablets and smartphones. There are also automatic compliance checks, and you can give feedback to employees easily, too. Contact is required for a pricing quote, and not surprisingly, the exact cost depends on the number of users, features and add-ons chosen. When it comes to document management, M-Files aims to improve internal workflows, and to ensure important information is kept secure at all times. Its customers include many large corporations such as Comcast and Yokohama. There’s a single vault for a plethora of files, and you can easily find them by client, project, date, status or other criteria. The software aims to avoid duplication – it’s quite common to end up with two copies of the same report, or possibly more. M-Files will alert you if a document has been saved twice by analyzing names and project data. You get some great integrations too, including Microsoft Office and Salesforce CRM. There is a free trial available, but pricing isn’t stipulated on the site, so you have to get in touch for a quote. Docuware takes a cloud-based approach to document management. It integrates cloud storage and office automation to create a digital workplace. This paperless approach to the full spectrum of office tasks is another example of the digital transformation which is driving many processes these days. Docuware offers services to create a ‘cloud workflow’ when it comes to documents. It allows services to be purchased on a small scale as needed, and then as use-case scenarios are created, and reliability is ensured, the service can be scaled up for a larger deployment. Mobile apps that can integrate into this workflow are also offered, facilitating the likes of scanning receipts on the go, approving invoices for speedy payment, and signing forms directly on the device. While Docuware does offer a demo, there is no free trial, and the pricing, which of course depends on the services chosen, is otherwise hidden and requires the prospective buyer to get in touch for a custom quote. Within big organizations, there are often processes and regulations put in place to ensure documents are compliant and follow company guidelines. But when you have a ton of files, it can be hard to follow such rules. 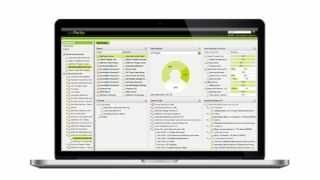 MasterControl, which is used by some of the world’s largest regulatory bodies, is document control software that addresses complex regulations and standards around the globe. It aims to reduce compliance cost and increase internal efficiency. The system fully automates routing, delivery, escalation and approval of vital documents. It also sports a centralized, secure archive where you can store and search for business files. There is no indication of a free trial, and pricing requires contacting the company for a quote. If you’re looking for a cloud solution for creating documents, then you should definitely check out XaitPorter. The great thing about this system is that it’s extremely flexible. You’re able to collaborate and work on documents with colleagues simultaneously, and you can easily share feedback with each other. It also manages all aspects of workflow, so you don’t have to worry about formatting, numbering and layout. XaitPorter has some useful tricks on the integrations front, as well. The software can work with Salesforce, Oracle, SAS, Microsoft Office and Dynamics, SharePoint, OpenText and Dropbox. And it’s currently used by some 45,000 firms across the globe. While there is a demo available, there is no free trial, and pricing requires getting in touch for a quote. Dokmee puts efficiency and security first, offering a number of document management offerings you can pick from. The entry-level Dokmee Desktop is only for a single user ($249, £196), but carries most of the core index and search functions, plus organization and sharing features, and most of the editing functionality too (save for version control). If you want to avail yourself of all the features, including the important security capabilities, then you’ll need to move up to Dokmee Professional, which also allows for multiple users – and a range of integrations such as Microsoft Office Add-ins (for Word, Excel and Outlook). There’s also a well-featured cloud version of the DMS, although you’ll need to contact the vendor for pricing on this and the Professional package. A further boon is a free mobile app which is available for iOS and Android devices.